An unlikely arrest of an alleged international drug lord by two Montreal police officers patrolling on bike has earned them major props within their unit. 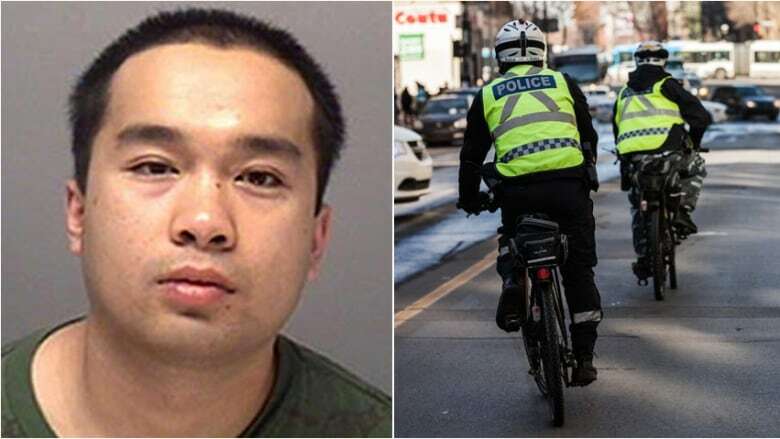 Two Montreal patrol officers on bikes are being lauded by their superior after their quick thinking resulted in the accidental capture of one of America's most-wanted fugitives. The officers, whose identities are not being released, were responsible for the arrest of alleged drug lord Katay-Khaophone Sychanta. "I'm very proud of these two officers," said Cmdr. Miguel Alston, head of the local police station. Sychanta, 35, had successfully dodged police for over 10 years and is suspected of being a kingpin in an international drug and money smuggling ring. He was on the U.S. Department of Homeland Security's list of ten "most wanted." In the end, his own hubris and the clever work of two local patrol officers were responsible for his arrest. On Aug. 23, Sychanta was seen grinding marijuana to roll a joint with another man on a bench, just northwest of the Bois -Franc train station. The officers were patrolling the adjacent bike path and approached Sychanta to inform him what he was doing was illegal. They discovered he was carrying 40 grams of marijuana on his person. Some of it was in bags and some was stuffed in his pockets, said Alston. The officers started to write a ticket for pot possession. At first, Alston said, Sychanta co-operated with police. But when it became clear he could be arrested, he fled on foot. One officer ran after him — the other hopped on his bike to chase him down. He was caught nearly immediately and was handcuffed and taken to a nearby police station. They asked Sychanta for his identity and he gave them the name of a man from Maryland. The officers didn't believe that was his true identity and Sychanta couldn't provide the names of friends to corroborate his story. "The feeling was, no it's not his name, it's not his real name," said Alston. They took him to the local detention centre and fingerprinted him. Then they realized his true identity was one of North America's most sought-after suspects. Sychanta, whose last name is also spelled Sychantha, is suspected of being an organizer in an international drug smuggling organization. He's facing charges in the United States and Canada for drug-related charges. He's also suspected of being responsible for the smuggling of cash, guns, cocaine and heroin from the United States into Canada. Before his arrest, his whereabouts were unknown. U.S. Immigration and Customs Enforcement (ICE) believed he could have been hiding in the United States, Mexico, Canada or Asia. ICE also noted he has a history of threatening Homeland Security special agents and he should be considered "armed and dangerous." Sychanta is a dual citizen of Laos and Canada. He was charged and pleaded guilty to possession of drugs in Montreal. He will remain in Quebec jail for a short period. Later he'll be sent to Ontario, to appear to be charged for crimes allegedly committed in Ontario, and then he could be extradited to the United States to face more charges. Alston could neither confirm nor deny whether Homeland Security or the FBI have congratulated his officers on their arrest. He did say his officers have been joking about the fact that the FBI was offering up to $25,000 US for information leading to Sychanta's arrest — money these officers are unlikely to receive. "My officers were laughing saying 'Where's my $25,000?'" Alston said. "But it's part of the job. They did their job and they did great." He said there will be an event to congratulate the officers, who have both been with the force for several years. Alston said their reaction to the arrest has been very humble. "They say, 'We were just doing our job.'"